If there was ever a state perfect for a campervan hire holiday, it has to be Tasmania. Central Tasmania is blessed with majestic and beautiful landscapes reminiscent of the tundras of Finland, the fjords of Norway and the Scottish Highlands. You will wonder if you have been transported to some beauty spot in Europe, as you are so are so high above sea level and surrounded by a landscape scarred by glaciers. Welcome to the Northern Highlands of the Central Plateau, also known as the Lakes District. Compared to the east and northern coastal areas of Tasmania, the Central Plateau is just as rich in scenery but it is more scarcely inhabited. Bothwell and Deloraine are the only major settlements in the Great Lakes region. However, there is still plenty to do in the highland region, such as the fishing, investigating the region's history, bushwalking, exploring the various peaks, caves and waterfalls. The best route through this area is from Bothwell to Sheffield, a route that which can be driven in the two-and-a-half hours, but could take weeks to complete. Starting with Bothwell; from Hobart, the town is a one hour drive through some of the most beautiful landscapes in Tasmania - and that is really saying something - and Bothwell itself is a gem for the history buffs. The village was settled in 1824 by Scottish immigrants; which probably explains why it is home to the oldest golf course in Tasmania. Bothwell contains some 53 buildings that are either classified or recognised by the National Trust. Many were built by convict labour, and a walking tour round the town can be most rewarding. Just north of Bothwell is the Thorpe Farm, which dates back to the 1800s but is still a going concern; it is famous for producing fine cheeses. There is a caravan park in Bothwell, if you want to stay a few days. After leaving Bothwell, there is a 40min drive to the alpine hamlets of Liawenee and Miena, perched on banks of the Great Lake, the second largest freshwater lake in Australia. These towns are among the few places in Australia to have a subpolar oceanic climate, where even the summer temperatures rarely get above thirty degree Celsius. They are surrounded by parks and reserves, by the Great Lake Conservation Area and the Great Western Tiers Conservation Area to the east; the Central Plateau Conservation Area, the Walls of Jerusalem Nation Park and the Cradle Mountain-Lake St Clair National Park to the northwest; and to the south are the Remarkable Rock Forest Reserve and the Top Marshes Conservation Area. This is seriously beautiful countryside, abounding with an abundance of opportunities to fish and hike. The campervan accommodation in Miena is the Great Lake Caravan Park, with powered caravan sites; and next door is there is the Great Lake Hotel, which can provide hearty lunches and dinners, provide information about trout-fishing tours and guides, and also can arrange boat hire and sell fishing licenses. East of Miena, Derwent Bridge is home to The Wall in the Wilderness. Sculptor Greg Duncan is carving the history of the Tasmanian Highlands in the form of a sculpted wall, made of panels of Huon Pine. Greg Duncan aims to carve 300 square metres of wood to form The Wall; a task he estimates will take ten years to complete. So far, Greg has carved scenes depicting the workers of the Tasmanian Hydro-Electric Scheme and the local forestry industry, scenes concerning the plight of the wedge-tail eagle, and the extinction of the Tasmanian Tiger. The sculpture is planned for completion in 2015. Heading North from Miena and Liawenee, on the road to Sheffield, you traverse the highlands and start down the tiers into the gorgeous farming community of Deloraine. This is a town worth spending some time investigating. Typical crops in the region are poppies, herbs, onions and potatoes. There are many colonial buildings to visit and so history was retained in this quaint town. Great Western Tiers Visitor Centre has the Deloraine & Districts Folk Museum set up to show what life was like in the 1800s, and also displays a large collection of horse and bullock drawn farming equipment; it is also the site of the stunning YARNS Artwork in Silk. For those who prefer natural attractions, there are the Liffey Falls in the glorious Liffey Falls Forest Reserve. Deloraine is the site of the Tasmanian Craft Fair, which is one of the major annual attractions of Tasmania and run over four days in the spring, so the town has lots of arts and crafts available. Just outside of the town, for the dedicated foodies, there is the 41 Degrees South, Salmon and Ginseng Farm. For campervan accommodation, you can try the Quamby Corner Caravan Park, the Deloraine Apex Caravan Park, or the Mole Creek Caravan Park. Speaking of Mole Creek, you have to visit Mole Creek Karst National Park, with some of the world's finest and most visited cave systems, including the Marakoopa Cave and the King Solomons Cave. While still in Mole Creek, those with a sweet tooth should take the time to visit The Honey Farm at Chudleigh. 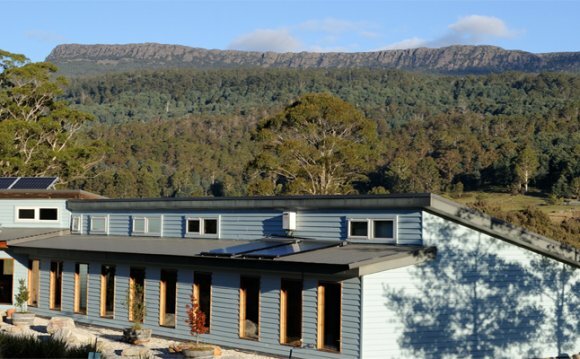 Not far from Mole Creek is the Trowunna Wildlife Park, which is home to representatives of the Tasmanian devil, koalas, wedge-tail eagles and other native wildlife. After leaving Deloraine and Mole Creek, and before heading into Sheffield, take break at Elizabeth Town, to partake of the sumptuous goodies at the Christmas Hills Raspberry Farm and/or the Ashgrove Cheese Factory. You will need energy for all that walking you do when you are sightseeing. Sheffield, though not actually part of the Highlands, has become a major tourist attraction due to it being promoted as a 'Town of Murals', with over 60 murals depicting the area's rich history and natural scenery scattered throughout the town. As well the murals, there is all of romance of steam trains at the Redwater Creek Steam and Heritage Society site, also the site of annual Steamfest held in March. 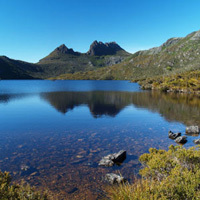 For the hikers, there is Mount Roland and Lake Barrington to explore. For the young at heart is Tazmazia, in the Promised Land (it really exists, just a ten minute drive from the centre of Sheffield), with its eight mazes and 1/5 scale village of Lower Crackpot. And, of course, there is the Sheffield Museum, with its displays of artefacts from Sheffield's history.